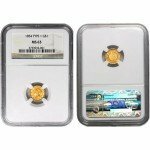 Customers: Please take note that these coins will be certified by either the PCGS OR NGC and graded as MS63 condition. We will select coins from years ranging from 1839-1908 to fulfill your order based on our current inventory selection. 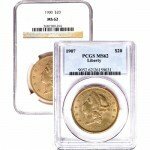 The $5 Liberty Gold Half Eagle would enjoy over six decades of circulation from 1839-1908. As one of the few coins minted prior to the discontinuation of gold currency in 1933, the $5 Liberty Half Eagle has become a historically significant collector’s item. Its popularity among collectors and investors is also due to its rare denomination of $5 USD. Every $5 Liberty Half Eagle coin possesses a gold content of .24187 troy oz. 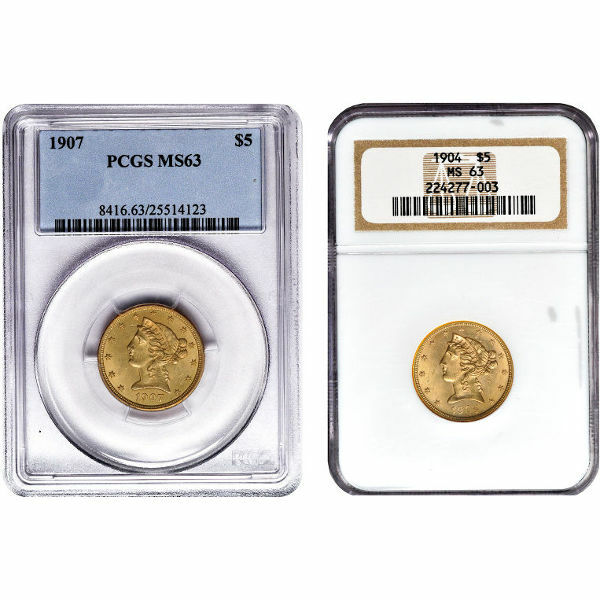 The half eagles included in this particular collection have also received an MS63 grade by the NGC (Numismatic Guaranty Corporation) or the PCGS (Professional Coin Grading Service). Despite evident wear, coins assigned an MS63 grade are still considered to be in acceptable condition. In order to prevent any further damage from occuring, each coin has remained sealed in its original NGC or PCGS examination slab. Inspired by Greco-Roman art, designer Christian Gobrecht offers viewers a classical interpretation of Liberty. With her elaborately styled hair and her face turned in profile, Liberty resembles one of the goddesses or rulers depicted on ancient currency. Also reminiscent of these portraits is the border of stars and text surrounding her profile. Depicted on the reverse of the coin is the heraldic eagle. This iconic symbol consists of an eagle spreading its wings to their full span from behind a large shield. In its talons, it carries an olive branch and a bundle of arrows. Printed above this image is our country’s name. Customers are advised that there may be some inconsistency regarding the appearance of the coin’s denomination. Depending on the coin’s mintage date, the value can appear as either “5 D.” or as “Five D.” Also worth noting is the presence of the “In God We Trust” motto, which will only appear on coins minted after 1866. With its memorable design and rare denomination, the $5 Liberty Gold Half Eagle is certain to add both artistic and historical merit to any collection or investment portfolio. For more information, please give us a call at 888-989-7223. We are also accessible through live chat or email.